If you talk to hunters, one fact comes out loud and clear – all hunters of the yore were liars. Their ability to lie was directly proportional to their tendency to hate predators and inversely proportional to good human values. In the above story, it is clear that the pseudo hunter has built his fiction on the dark image of wolf painted in those days. What we now know of wolf, this story would be discarded by people within less than 5 seconds. In fact, a little bit of exaggeration is considered to be permissible in non-fiction adventure stories of today. For example, adventurers and naturalists tend to merge the events observed over several days and instances into one continuous series of events observed during a day. A way to avoid getting into exaggeration is what modern writers do. They write about the main story, which could be short to the point of being bland, within a very broad canvass that comprises many other related topics. An example is John Vaillant’s The Tiger: A True Story of Vengeance and Survival. Most writers on hunting are a bit untruthful. My grandpa’s line was you couldn’t believe half of what you read in sports magazines. At least they didn’t write about the wolf killing children, which would have been a highly unusual occurrence in North America, much less the Eastern states. On the contray, it was either Jim Corbett the world renowned hunter of man eating tigers or Stanley Coran (my memory deceives me due age) who narrated a “true story” of two odd shaggy creatures running around near a village in India in early 20th century. The hunters followed the track of what they believed were wolves to a den. On approaching the den, the crowd confronts a male wolf who escapes, but poor female wolf was shot to death as she defended her litter. They discovered a litter in the den comprising of two human girls behaving exactly like wolves and continuing to do so for many years of their lives. The Rev. Singh’s story appears in one of Coren’s works. I can’t remember which one. However, there appears that the Reverend Singh was lying about Amala and Kamala’s origins. They were two girls that may have had autism or Rett syndrome. In that part of the world, it was once common to say that children with learning disabilities were raised by wolves. Kipling didn’t come up with the story about Mowgli on his own. Yes, now I remember. It was indeed Stanley Coren in his ‘How to speak Dog’. And of course, it was proven to be fabricated. Thanks for pointing it out. In India, hunters and writers were normally projecting the image of wolves in accordance with general perception of the animal there. In North America, hunters were projecting an image in accordance with general perception here. One should read the old wolf trapping narratives from the Old West. The wolves are always almost super-human in their cunning. And very human in their depredations against livestock. That would make sense lol. Any good book(s) that you could recommend to read on this? I will appreciate. The Great American Wolf by Bruce Hampton has a great compendium of Old West wolf stories. He misses the mark on the red wolf, but then it was written well before all the important genomic analysis came out. Thank you. It looks like an interesting read. I will definitely get hold of it. I prefer Setons stories. He at least clearly had a serious appreciation of wolves as living breathing creatures deserving respect. Incidentally, there was an article about an Oregon wolf crossing into CA, so maybe someday there will be wolf populations in CA again. I suspect the original (now extinct) CA wolves were probably more closely related to the (now endangered) Mexican wolf, at least in the S. Calif areas, but who knows? Maybe they were just a continium of the Northern wolves (the Oregon animals hail from Washington) and those of the South. 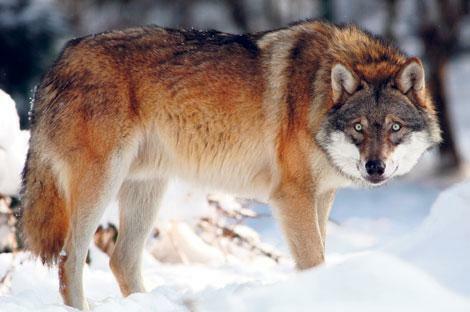 Despite the fact that it may possibly represent the demise of the Eastern wolf in WV, as a genealogist, I always appreciate stories like this. Its tales like this that really flesh out otherwise dreary series of begats. Can we trust their veracity 100%, of course not–they don’t come close to being primary evidence. Nevertheless, they do provide the genealogist/historian with a window into the nature of the people of WV at the turn of the 20th Century. For me personally, the story sheds a bit of illumination into the lives and mindsets of my Straight family ancestors in Eastern KY (Catlettsburg, just t’other side of the Ohio from Kenova, WV.) My grandfather, Herbert Lee Strait/Straight, was b. there just about the time of this tale. I’ve also come across maybe three wolves while hiking near Hawks Nest and Bluestone over the course of a few years, which were very skidish and after catching site of me sauntered off into the woods. Whenever I see a wolf OR a coyote I high-tail it back home. They are wild animals after all. Dangerous ones.